Enjoy good ol' Easter fun for all the family in the Aqua Dome and for those with a sense of adventure there will be Easter Egg Hunts over the Easter weekend...see below for times of Egg Hunts & opening hours. 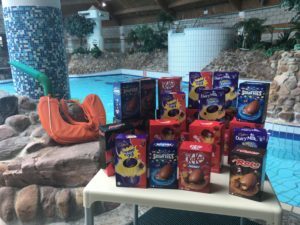 The Aqua Dome will be hosting a total of 16 Easter Egg Hunts from Good Friday to Easter Monday. There will be 4 chances to find these Easter Eggs each day and the lucky winners get to keep the Easter Eggs along with winning a free complimentary ticket to the Aqua Dome and the Aqua Golf. There will be 4 Easter Egg Hunts each day at 10am, 12noon, 2pm & 4pm. 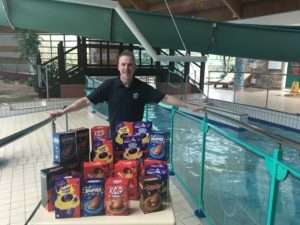 This competition is open to all children under 18 years of age (only 1 prize per person allowed) and entry to Easter Egg Hunt is only available after purchasing Aqua Dome entry. These Easter Egg Hunts have been a big success over the last number of years with children of all ages taking part. Clues will be given as to where the Easter Eggs are and then the big hunt is on! It's always fun to watch the children try & guess the location of the Easter Eggs and then there's great excitement when the Eggs are found....great craic! Did you know these 8 facts about Easter? 1. The tallest Easter egg chocolate was made in Italy in 2011. It stood at 10.39 meters and weighed an astounding 7,200 kg. 2. The art of painting eggs is called pysanka, which originated in Ukraine. It involves using wax and dyes to color the egg. 3. The term Easter gets its name from Eastre, the Anglo-Saxon goddess who symbolizes the hare and the egg. 4. The exchange or giving of Easter eggs actually dates back to before Easter and the giving of eggs is actually considered a symbol of rebirth in many cultures. 5. Are you an ears, arms or tail person? Seventy-six percent of people eat the ears on the chocolate bunny first, 5 percent go for the feet and 4 percent for the tail. 6. Next to Halloween, Easter is the biggest candy-consuming holiday of the year. Good thing they are almost six months apart, perfect for your yearly dentist check-ups! 7. The Easter egg is said to symbolize and represent joy, celebration and new life. 8. The idea of the Easter bunny giving candies and eggs is said to have originated in Germany during the middle ages. No matter how old you are or where you are in the world, Easter is a fun family tradition that never gets old. From Easter egg hunts to the taking your first bite into that chocolate bunny, Easter marks a long weekend, filled with fun.